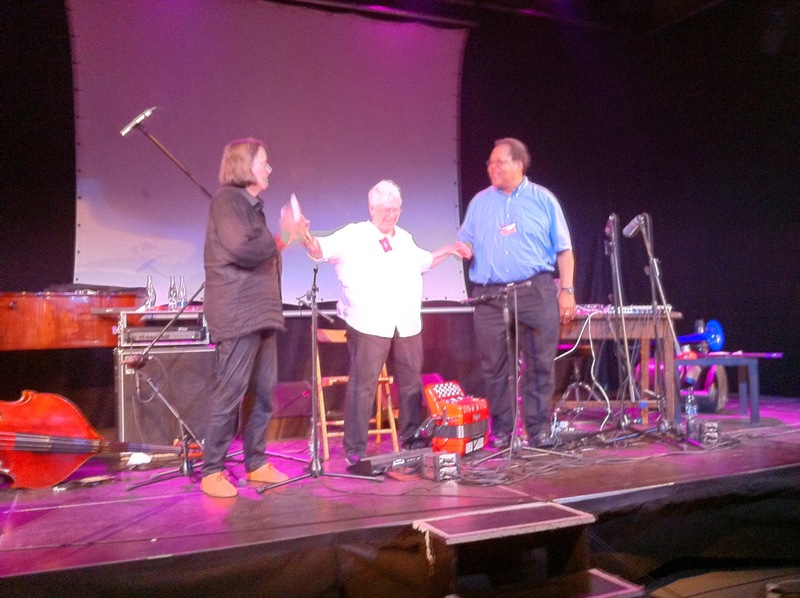 Tonight as part of the Agosto Foundation’s vs. Interpretationsymposium and festival at the NOD arts space in Prague, we heard a freely improvised performance by the trio of Pauline Oliveros (Roland V-accordion), Joëlle Léandre (double bass and voice) and George Lewis (laptop, trombone). 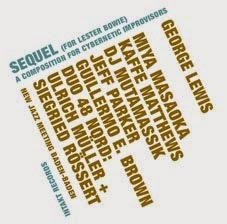 This morning, George Lewis gave a talk on the prehistory of improvisation studies, making a case for approaching improvisation not as a study of criteria or constraint but of what he called “conditions,” which seemed to me to be a call to attend to the diversity of generative circumstances, and their intersection in historically situated performances. 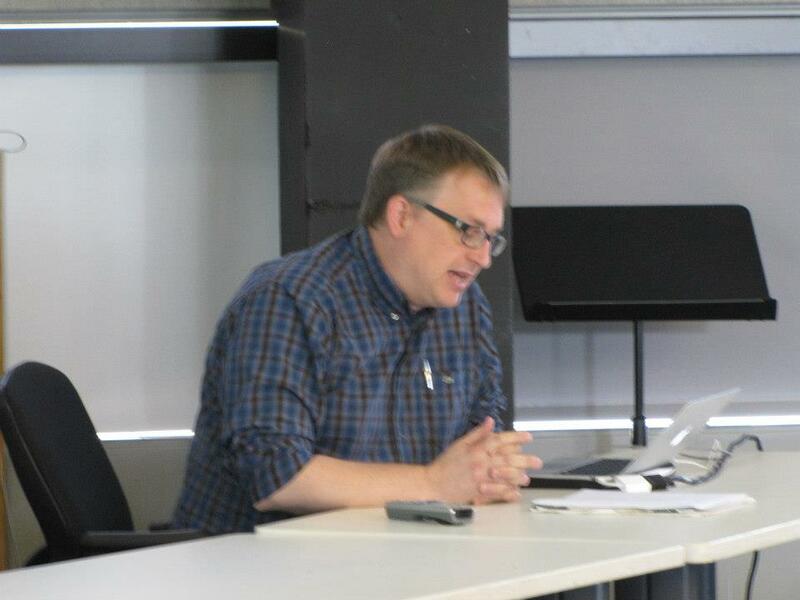 He was arguing, gently, against defining improvisation as such, and instead asking his audience to consider how improvising might open up possibilities for self-aware creative practice. The concert this evening was introduced by, I believe, Cynthia Plachá of the Agosto Foundation, who reiterated something Joëlle Léandre had said at a workshop this afternoon, that when you improvise “you must be prepared for the unprepared.” Both of these assertions – around the conditional or situated sharing that improvisation enacts, and around the paradoxical acuity involved in improvisational practices – informed the trio’s collaborative music-making. 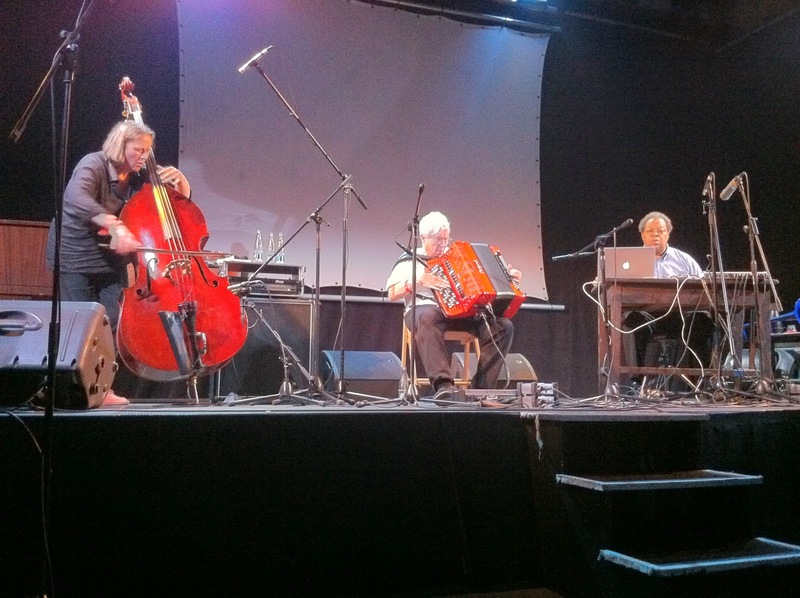 They performed one 45-minute piece, recorded by Czech Radio for broadcast, which apparently Pauline Oliveros had named “Play As You Go” ahead of time, although there wasn’t any pre-planning. Joëlle Léandre’s playing had a firmness of touch and such a strikingly clear sense of line or trajectory, her tone consistently full and resonant. 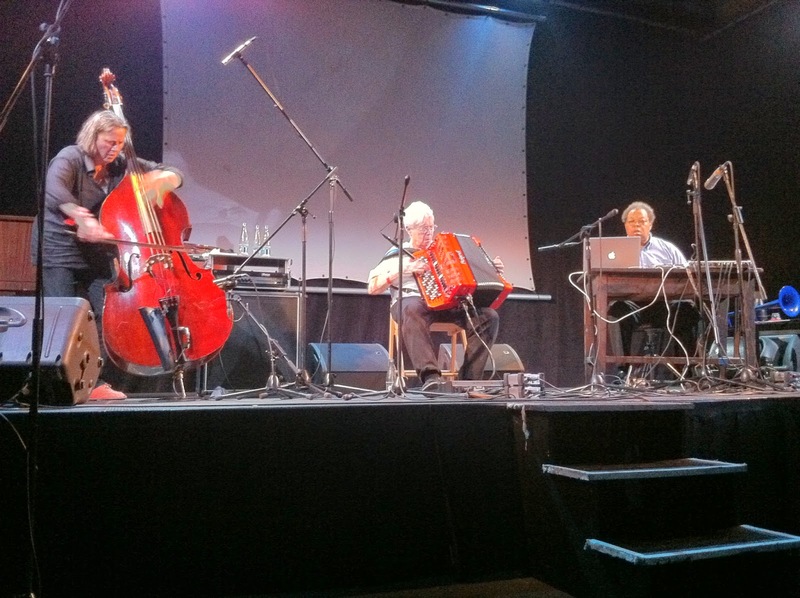 Pauline Oliveros’s electronified accordion shifted between foreground and background, often supplying aural textures that were by turns cohesive and disruptive, simultaneously braiding into and fraying at the trio’s combined sound-palette. 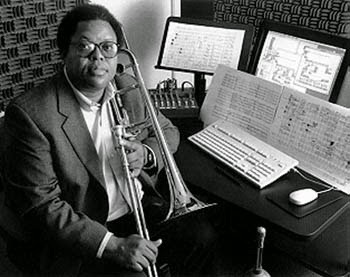 George Lewis layered samples from his laptop, many of them having a certain digital brightness that he subsequently often pulled and muddied, electronic sheen mitigated by the more closely corporeal sounds of breath and lip, particularly when he used his blue (!) trombone as both a sampled sound source and as an unmodified instrument: his characteristic fierce blatt, at the few moments when he did seem to dig into his horn, was instantly recognizable. But this wasn’t a music of solos or singular voices so much as of organic reciprocity and co-creation. There were some passing moments – when Joëlle Léandre started to sing lyrically about the slightly oppressive heat in the performance space (“It’s hot, it’s hot . . . “) or when Pauline Oliveros echoed a cough from the audience by jabbing her right hand at the accordion’s lower keys – of humour and irony, suggesting how all sonic resources, high and low, occasional and musically dense, could be repurposed into interactive soundings. The music didn’t so much progress or develop as trace its way through a loose series of temporarily sustained, situated idioms – sometimes meditative, sometimes contrarian, sometimes melodically assertive, sometimes coevally plural: layers of shifting texture, refigurings. This was a brilliantly sui generis music, and we left the concert feeling energized, enlivened and moved. Jayne Cortez passed away—went flying home—on December 28, 2012, so this small tribute comes a month or two late, but I did want to record publically my sincere admiration for and indebtedness to her poetry and her performances. There was a proper obit in The New York Times, and there have been many warm tributes, including one from critic Howard Mandel. I met Jayne Cortez only once, and only recently, when she gave a keynote talk about her own work at the 2011 Guelph International Jazz Festival. She presented selected recordings she had made over the past 30 years with her band The Firespitters (whose revolving personnel often included her son, percussionist Denardo Coleman, as well as members of Ornette Coleman’s electric ensembles), and her comments focused on elaborating the chiasmic chant from the title piece of her recent Best of CD: “Find your own voice, and use it. / Use your own voice, and find it.” This sounds like advice for new performers – and it is certainly that – but the aspirational panacea of self-discovery these crossed lines offer is only part of their intention. I have to admit that I am well trained to be suspicious of the expressive, and for better or for worse I incline toward an arch poetic technique that finds its touchstone in Martin Heidegger’s maxim, Die Sprache spricht: language speaks itself. Wimsatt and Beardsley’s affective and intentional fallacies are difficult beasts for me to shake. It can be perilous for a non-African-American like me to associate the expressive with racially marked text, and to implicitly divide it off from canonical, oblique, academically-mediated and difficult Poetry with a capital P; black identity, down that slippery slope, gathers in the emotive and the embodied, while technical linguistic prowess remains the provenance of a white cultural dominant – a racial bifurcation with which I’m not just uncomfortable but which also belies what most poetry, for me, wants to accomplish, to speak. I think George Lewis’s conceptof the Afrological – which he links principally to musical practices – is useful to invoke here, in as much as it aims to foster dialogue (“Gittin’ to Know Y’All”) without necessarily enabling cultural or racial appropriation. 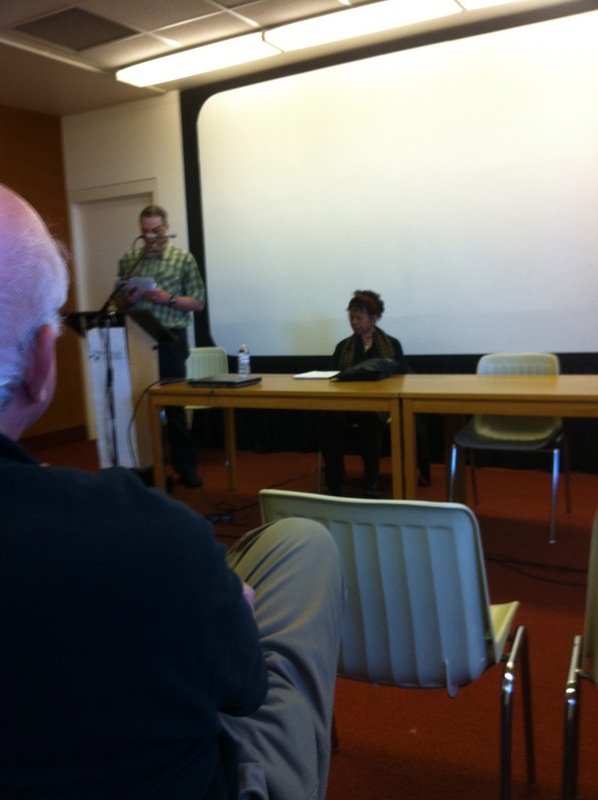 My memory of Jayne Cortez isn’t so much her talk as of a conversation we had the next day, by chance. We were both staying at the same hotel in Guelph, and ended up riding in the same Red Car van to the Lester B. Pearson Airport in Toronto, to catch our flights home. The trip takes nearly an hour. Ms. Cortez remembered me being at her talk the previous day, and asked politely after my own poetry, which I’d read at the colloquium. We talked about emerging writers, and about her husband Melvin Edward’s sculptures, and I remember she praised William Parker’s generosity and musical vision. But most of all, what I recall is her tone and spirit; she talked with you, not to you. She, too, seemed generous and open; she smiled almost the whole time we talked. I admire her greatly that she would so happily and freely engage with somebody she’d just met and hardly knew. It was like she genuinely wanted to know about you and your inclinations, and to share hers. Respectful exchange, a crossing. One of my favourite pieces on her compilation CD is a duet with baritone saxophonist James Carter, an improvised blues (called “I Got the Blues,” recorded in 1994) involving, as her notes put it, “verbal call and response between the poet’s voice and the baritone saxophone sound.” Neither she nor Carter is hesitant or diffident; they know their voices. Cortez doesn’t offer any sort of phonemic sound-poetry, but sticks to the declarative, what she does best: an edgy, passionate, and fierce lyricism. Still, the piece is as much interchange as exchange; they listen and speak to – with – each other, and it is the alternately assertive and yielding textures of that conversation, as much as its content, that come to matter. Cortez says that writing a poem is a matter of getting your mouth on the paper, of expression finding its way over a page. But I think that the reverse might also be true: to find a way to sound out off the page, to make those marks speak—mouth to paper, paper to mouth. Jayne Cortez’s work, for me, offers a model of committed self-expression, a finding.